This means using less non-renewable resources. Reducing the amount of raw materials we use to manufacture products. 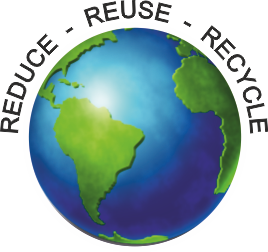 Reduce wastage of raw materials used in the manufacture of products. Reduce the amount of energy used to transport products. Perhaps, by manufacturing products locally. Reducing the packaging we use to ‘contain’ products. Use less supermarket carrier bags. We should recycle as many materials as possible, as this reduces the amount of new materials required to manufacture the products we want. A vast range of materials can be recycled particularly paper, card, and many plastics. Recyclable materials can be reformed / processed and made into a new products. Where possible, we should reuse products or their components / parts when they are disassembled, at the end of their life cycles. Products should be designed, so that they can be used again or at least their parts, with minimal reprocessing. This is usually cheaper and more environmentally friendly, than using new raw materials. A good example of reuse is glass bottles, which are washed and refilled. Also applies to some plastic bottles.